For some years, I have been trying to grow wildflowers in order to attract insects to my rather wild garden at Torbreck, just outside Lochinver (NC085242). I have collected seeds during visits to South Wales, particularly from Kenfig Nature Reserve, a favourite haunt of mine. Last summer, the seeds of bristly oxtongue Picris echioides, which I found there, produced three tall plants which did indeed attract insects (mainly small flies) to their yellow composite flowers. The stems and leaves of this species are covered in tiny grapnel-like hairs. 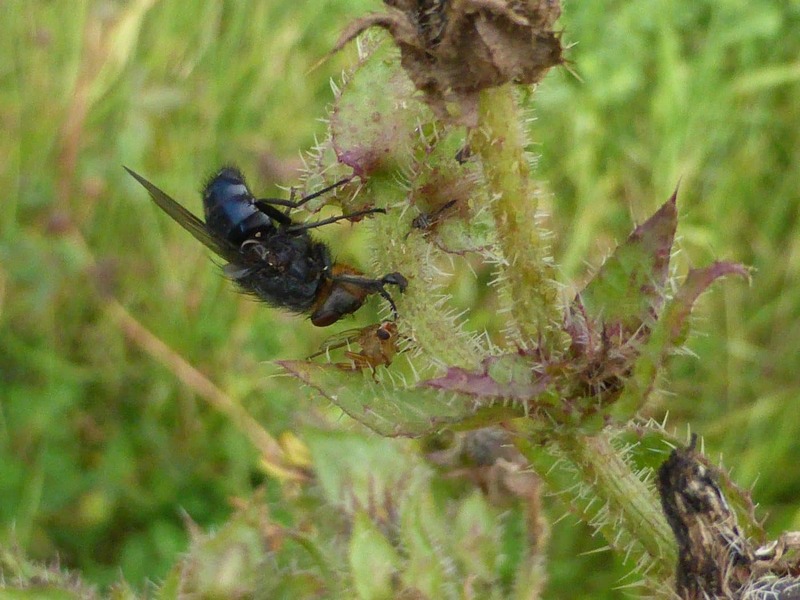 On the 24th September 2017, I noticed two flies, one a greenbottle and the other a bluebottle, stuck to the stems of one of the plants. It took me a while to work out that they were both attached by their tongues and apparently not held by the hooked hairs. The bluebottle was still alive and I managed to release it without injury, but the greenbottle was dead. It was sent to Murdo MacDonald, who identified it as a female Lucilia caesar, which is a very common species. Ian Evans wondered if the flies might have been infected with the parasitic fungus Entomophthora, which makes them act strangely, but this did not seem to be the case. 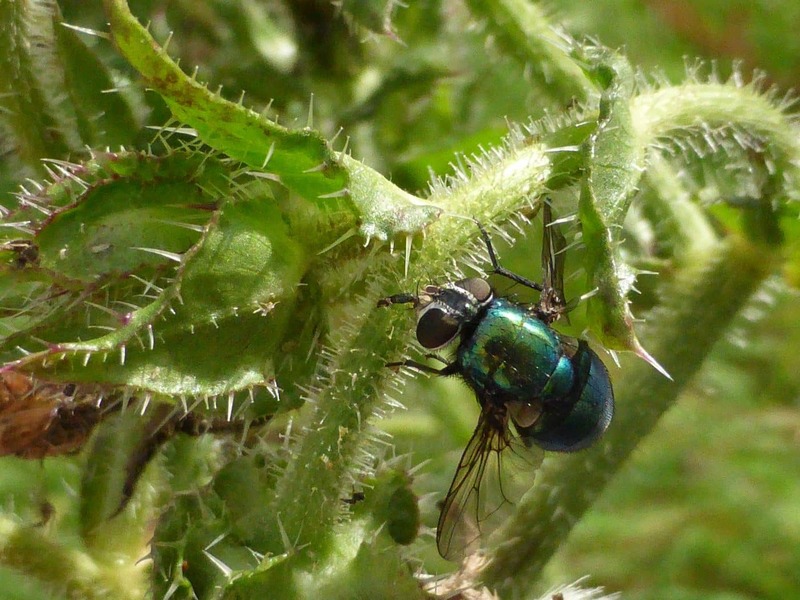 There is an aphid in the close-up photo of the bluebottle, so maybe the stems were leaking sap because of damage by aphids and this attracted the flies. 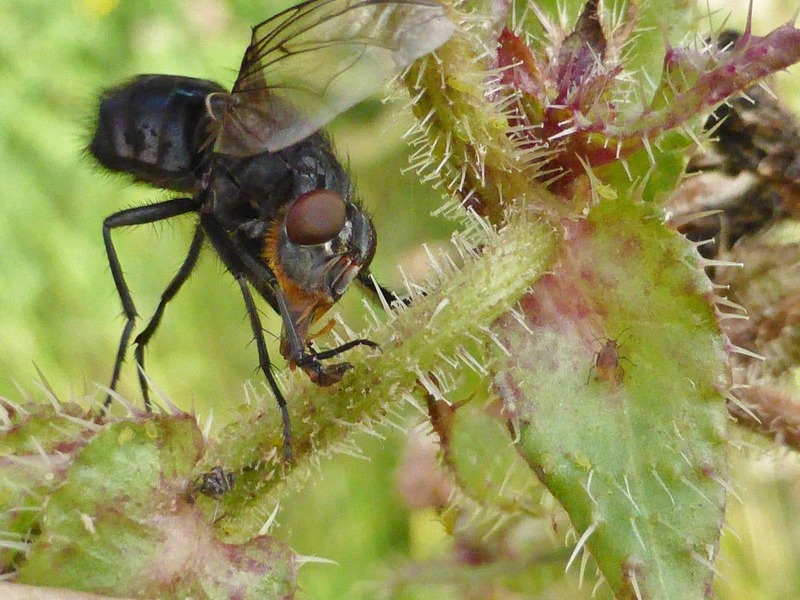 However, why would flies put their tongues onto such a hairy plant stem rather than visit the flowers? I have found one reference to damselflies and beetles becoming entangled in the hooked hairs of this plant. Perhaps the flies were caught by them after all and became dehydrated, so put their tongues onto the stem surface to ingest some moisture. Any other suggestions would be gratefully received.